However, when meetings are in session, conference rooms also must be able to support a broad range of power and digital-media needs. This can mean offering easy access to USB device charging, along with power outlets for laptops and projectors and data connections for broadband networking. 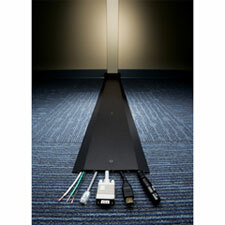 Modern raceway systems have evolved to support both multipurpose flexibility and easy access to power and data connections. And newer over-floor designs enable retrofit installations requiring no penetrations of the floor plate – they can even be installed right over carpet. No longer do room designs need to be tied to static poke-through devices in locations that might not fit current needs. How adaptable is the system? Look for options that include the full range of transitions, from wall to floor distribution as well as same-surface curves and junctions. Is it ADA compliant? To make things easier for those in wheelchairs – and to minimize trip risks for everyone else – The Americans with Disabilities Act requires floor interruptions such as raceway to maintain a low, unobtrusive profile. Does it address needs for data and A/V communications, as well as power? Multichannel designs provide dedicated pathways to meet all equipment needs.